Suffolk Public Schools recently held the Dedication Ceremonies for their two newest schools – Florence Bowser Elementary and Colonel Fred Cherry Middle. The ceremonies included city and school representatives, members of the project team, family members of the schools’ namesakes, and community members. 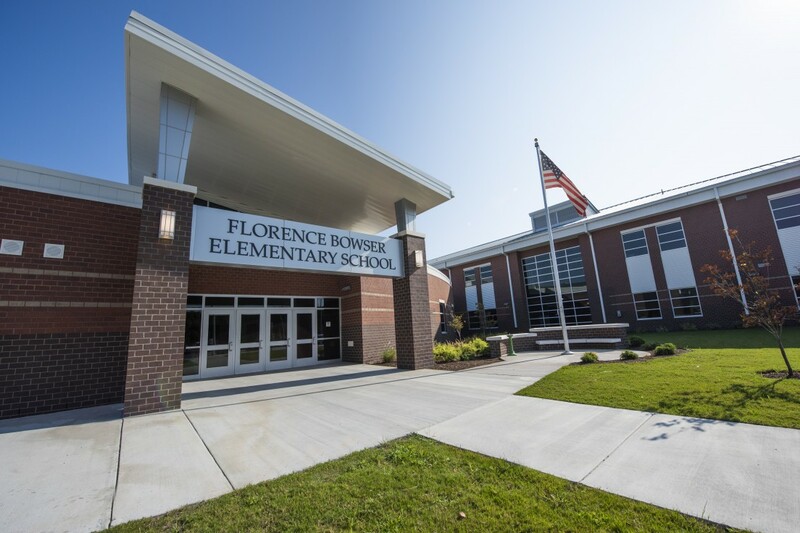 Florence Bowser Elementary is based on a long-running prototype for Suffolk Public Schools which includes Pioneer Elementary, Hillpoint Elementary, and Creekside Elementary. Florence Bowser differs, however, in that Suffolk wanted to customize the prototype to feature improved collaborative learning environments. The new, expanded design proudly features multiple extended learning areas that promote collaboration between students and staff, as well as cross-curriculum integration. These extended learning areas are centrally located within each grade house, allowing for multiple classrooms to work together on projects. The primary collaboration spaces are located at the heart of the school. 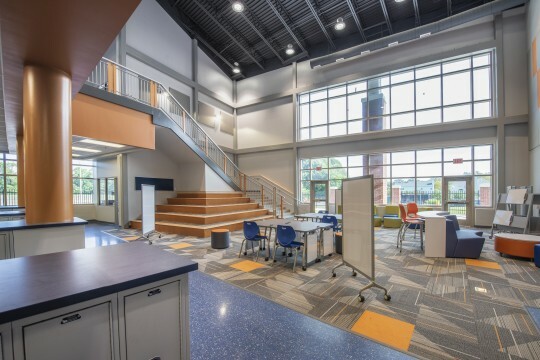 They consist of a multi-functional Learning Stair for all types of presentations and a large, flexible collaboration space on the second floor designed to enhance STEM activities. Clear separation of academic houses allows for grade level separation, as well as the filtering of natural light through all classroom wings. The gym and cafeteria arrangement allow the two spaces to be shared for special large-group events by opening an operable wall that is stored in the ceiling space. The media center is centrally located and accessible to the public. Colonel Fred Cherry Middle School was built to relieve overcrowding from population growth in Northern Suffolk. The 800-student school is organized into two zones. Public spaces, such as the auditorium and the gym, are located across the front of the building, while three different grade-level houses run along the back. The grade houses are separated from the public spaces by a main circulation area, which also includes the dining commons. A major feature of the two-story grade house design is flexibility and transparency. The first floor of each grade includes an Extended Learning Area designed to enhance collaboration between curriculums. The large expanses of glass between the classroom and the Extended Learning Area allows teachers to still maintain visual oversight from the classroom. Presentation areas that wrap the stairs offer a prime location for students to listen to a presentation from a guest speaker or from one of their peers. Courtyard spaces that were created between the grade houses frame a secure outdoor classroom, conveniently accessible from the science labs. The exploratory wing offers classes such as music, band, chorus, family consumer science, art, technology and a CTE class. The location of the performance arts spaces allows students to easily access the stage during a performance in the full-sized auditorium. The media center is centrally located on the second floor with an interior space that is open and flexible, featuring different zones within the space for a variety of seating arrangements. Both Florence Bowser Elementary and Colonel Fred Cherry Middle were named after people with powerful histories. Florence Bowser was a Virginia educator who brought the first school for black children to Nansemond County. With the help of grants, matching state contributions, and funds that she raised, Bowser opened Florence Graded School in 1920. Colonel Fred Cherry, a Suffolk native, served as an Air Force fighter pilot in the Vietnam War. After his plane was shot down in Vietnam in 1965, he was held as a prisoner of war for seven and a half years until his release in 1973. Cherry was the first and highest-ranking black officer during the war to be held as a prisoner. Following the recent success of these two new schools, Richmond Public Schools is planning to use the prototypes for their new middle and elementary schools.